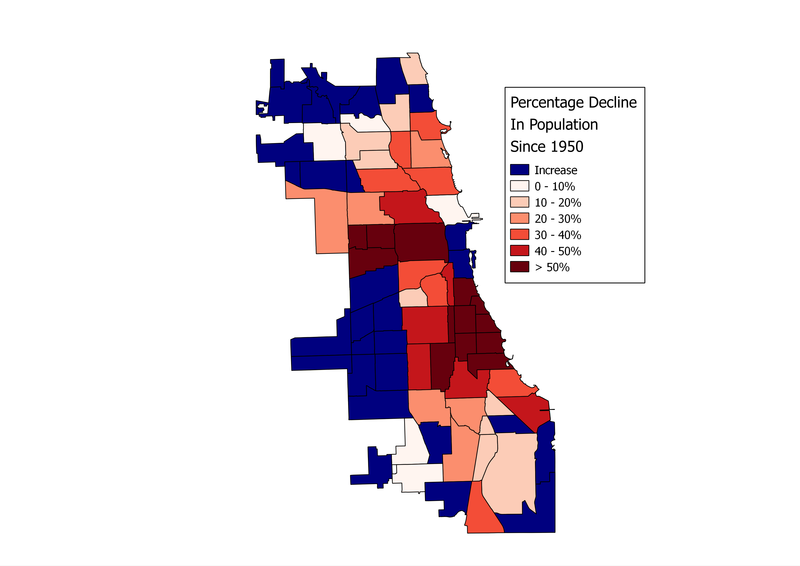 Where did Chicago’s population decline? Recently I’ve been doing a bit of digging into Chicago’s population figures, with the general research question being: what parts of the city have seen their population fall the most? There are a number of reasons that population matters, beyond civic pride: tax receipts, for example, as well as a consumer base for local businesses. Because jobs generally follow people, a shrinking center city also means that a larger percentage of jobs will be out in the suburbs, far from public transit, making that transit worth less and less to people who would like to use it to commute. As a result, people either a) just don’t have access to lots of jobs, b) spend a huge amount of time commuting, which they can’t spend, say, taking night classes or caring for their kids, or c) spend a bunch of money on a car, which is money they’re not spending on, say, night classes or caring for their kids. 1. The historic “black belt” – the area from roughly 26th down to Woodlawn (the neighborhood), from the Dan Ryan to the lake – got hammered. This isn’t surprising for a number of reasons. The first is that the black belt – especially the older parts in central Bronzeville – was horrifically overcrowded in the 1940s. In Making the Second Ghetto, Arnold Hirsch estimates that there were three times more people than were meant to live in the housing that existed. (Why were they so overcrowded? Because black people weren’t allowed to live anywhere else, and a huge wave of migration from the South had dramatically increased the city’s black population. Shortly thereafter, South Side whites began to flee for the suburbs, and Bronzeville began to empty of the relatively better-off black households who could afford to move further south.) Most of the others have to do with urban renewal, and the purposeful removal of people from potentially high-value land near the city center. 2. The difference between North and South Lawndale – the dark red area just above the dark blue area on the western edge of the city – is here, as in so many other ways, illustrative of the effects of public and private disinvestment and shunning on black communities, as opposed to working-class white and immigrant ones. 3. The wealthy north lakefront neighborhoods have lost significant population, contrary to popular belief. Lakeview is down over 20%; Lincoln Park, over 30; and West Town (not lakefront, but home to Wicker Park, Bucktown, and Ukrainian Village) is down over 40%. Why? A combination of a) a dramatic decline in the number of people living in any given housing unit, as large families were replaced by smaller families, childless couples, and people living alone; and b) a decline, or at best stagnation, in the number of housing units thanks to zoning restrictions. I’m not super familiar with Chicago, but it’s sort of surprising to me that Hyde Park seems to have had comparable population loss to the communities surrounding it. In Hyde Park, U Chicago engaged in widespread urban removal renewal, clearing blocks with low-income black residents. But even then, the population decline is smaller than in the rest of the South Side. Hyde Park’s population is a bit more than half off its peak – it’s gone from 55,000 in 1950 to 25,000 today. Pretty bad, until you realize some of the other deep red neighborhoods on the South Side have lost 75-80%. Could be interesting to see changes in household numbers too. Comparing current population to peak population could be interesting too – many of those neighbourhoods that are more populated now than in 1950 mostly grew in the 50s and maybe 60s, before they also began to lose population. If a neighbourhood goes from 30,000 people in 1950 to 60,000 in 1970 to 30,000 in 2010, that’s no better than gradual decline from 60,000 in 1950 to 30,000 in 2010. I don’t think any neighbourhoods are that extreme in Chicago, but many seem to have lost 10-30% since their peak.